Children hold up their new Everglades National Park quarters. 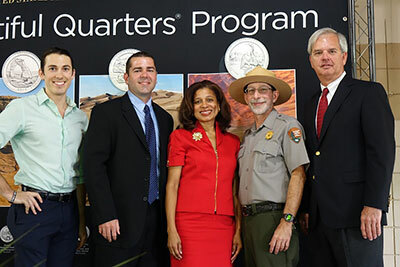 The United States Mint joined National Park Service officials on December 4th in Homestead, Florida, to launch the Everglades National Park quarter. The 25th coin in the America the Beautiful Quarters® Program and the last quarter for 2014 features a design inspired by the bird population in the Everglades. An anhinga with outstretched wings perches on a willow tree with a roseate spoonbill visible in the mid-ground. Both birds are found throughout the Everglades National Park. Inscriptions are EVERGLADES, FLORIDA, 2014, and E PLURIBUS UNUM. Chief Administrative Officer Beverly Babers represented the Mint at the well-attended event, where more than 1,000 people gathered to celebrate the release of the coin. Special guests joining Ms. Babers for the ceremony included Everglades National Park Acting Superintendent Bob Krumenaker; Homestead Mayor Jeff Porter and Vice-Mayor Stephen R. Shelley; and Inside Homestead host Josh Padgett. 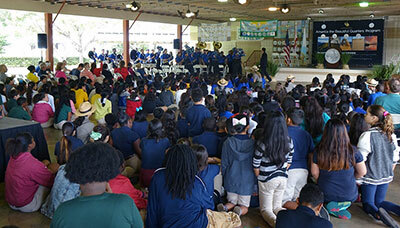 More than 700 school children were entertained by the South Dade High School Band as they waited for the program to start. The Homestead Air Reserve Base 482nd Fighter Wing Honor Guard opened the ceremony and the Homestead Senior High School Chorus sang the National Anthem. Everglades National Park had also conducted a contest, in which area schools competed to create Everglades quarter quilts. Teachers used lesson plans created by the U.S. Mint to teach their kids about the Everglades and how coins are designed and made. The children then created their own Everglades quarter designs, with schools submitting 4-by-8 foot quilts displaying 25 designs in a variety of multimedia materials. All of the quilts were on display at the event. 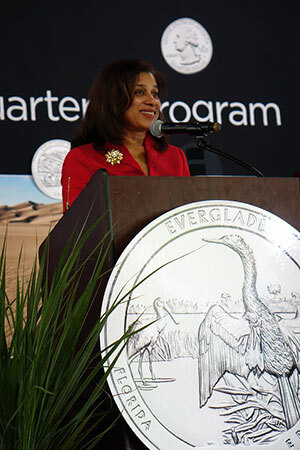 Following the ceremony, attendees traded their currency for rolls of new Everglades National Park quarters. Community Bank of Florida, the local bank sponsoring the coin exchange, exchanged $21,000.